Heat oven to 425°F. Line large cookie sheet with cooking parchment paper. In small bowl, mix granulated sugar and cinnamon. 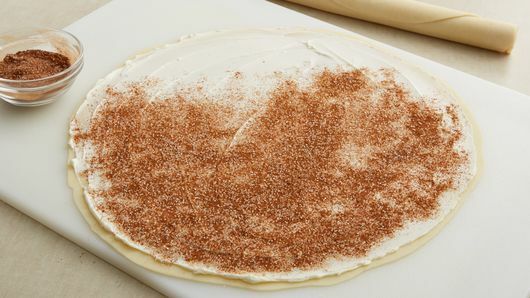 On lightly floured surface, roll one pie crust into 13-inch circle; spread with 3 tablespoons of the cream cheese spread. 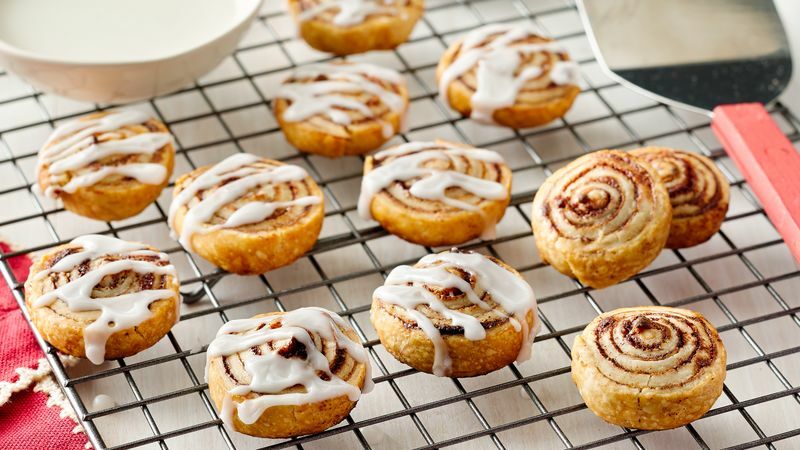 Sprinkle with half of the cinnamon-sugar to within 1/4 inch from edge. Roll up tightly. With serrated knife, trim about 1/2 inch from each end; discard. 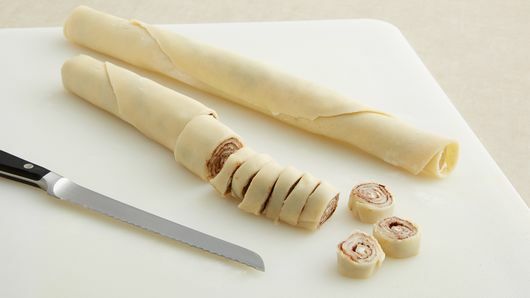 Cut roll into about 24 (1/2-inch) slices. (For easier cutting, use a wet knife, cleaning it after each cut.) Place on cookie sheet about 1 inch apart. Repeat with remaining crust, cream cheese spread and cinnamon-sugar. Bake 20 to 22 minutes or until golden brown. Remove from cookie sheet to cooling rack; cool completely. Mix powdered sugar and water until smooth and drizzling consistency. Drizzle over cookies. Let stand about 15 minutes or until icing is dry. The cream cheese spread is slick to spread if you microwave it in a small microwavable bowl 10 to 15 seconds before spreading. Looking for some extra oohs and ahhs? Sprinkle the cream cheese with 1/2 cup finely chopped pecans before sprinkling with the cinnamon-sugar. 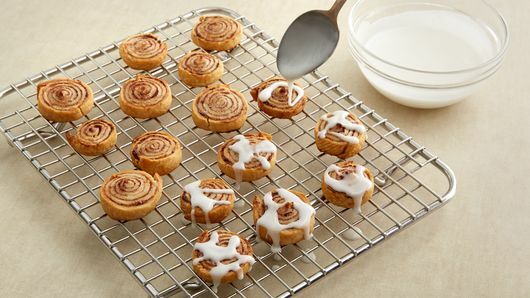 If you love the taste of cinnamon rolls, then you will absolutely love these easy cinnamon roll cookies (and you have an excuse to eat cinnamon rolls at any time of day now, too!). We like this recipe topped with traditional cream cheese icing, but feel free to switch things up! You can heat up some semi-sweet chocolate chips and drizzle over the top of these cookies, or you could try a bit of Nutella for an even more decadent twist, too. Make a big batch of these for a party like the recipe suggests, but also know you can scale down this recipe and make these cookies with leftover pie crust scraps if you just finished making a pie. Whatever way you decide to make these and when, one thing is for certain: they are simply delicious. Looking for some more cookie ideas? From sugar cookie cut-outs to caramel-stuffed chocolate cookies, we have a cookie recipe for every taste bud, plus all of the tips and tricks you need to make the best batch possible.